A happy, healthy betta fish is beautiful addition to your family. 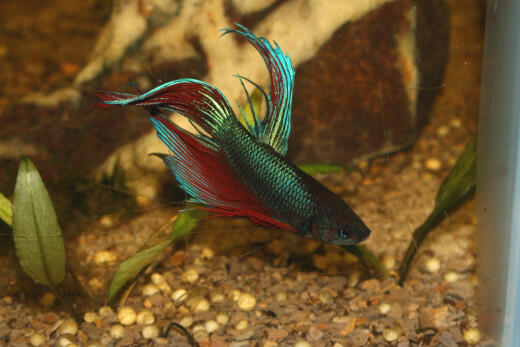 Learn more about how to care for your betta fish. Betta fish are often marketed as easy keepers because they can live in a relatively small, unfiltered, unaerated tank. However, clean water is essential to your Betta's health and small, unfiltered tanks require much more maintenance than a larger, filtered tank. 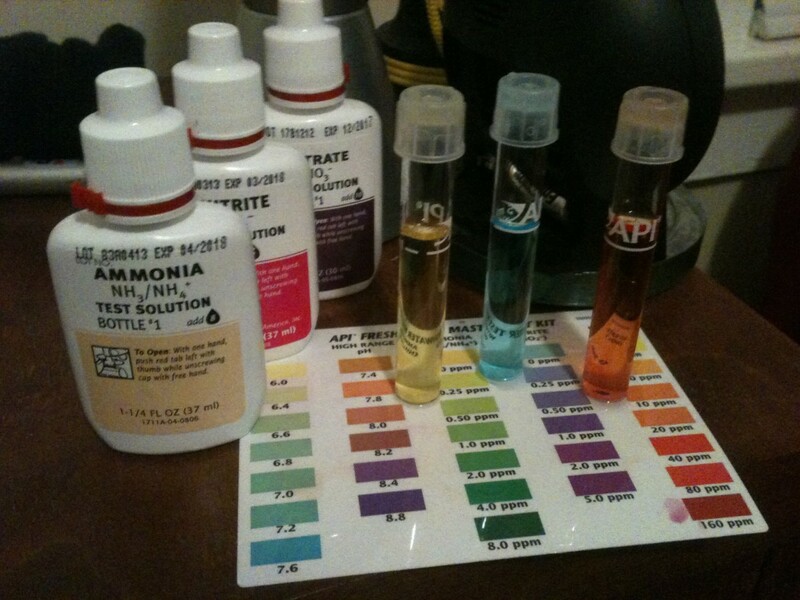 Aquarium Guys recommend: "for a tank smaller than a gallon, change 100% of the water once a day or at least 3x/week. For a larger tank, do partial water changes of 25% of water a week." The Betta's natural habitat is shallow, muddy puddles, with little water circulation. In order to survive in this rather extreme environment, the Betta and other members of the anabantoids (or Labrynth fish) evolved the Labrynth organ, which allows the fish to take oxygen directly from the air. Because of this special ability, Betta aquariums do not need to be aerated. A single Betta can live in tanks a 1/2 gallon or larger. Cover the tank, or leave the water down much lower than the edge of the tank-- in their natural environment, Betta jump from puddle to puddle, and are therefore prone to jumping out of the tank. You can use most tap water or bottled water for your Betta, but always use a Betta water conditioner to make the water perfectly habitable. Check the pH level, and adjust to as close to neutral as possible. The temperature should be between 72 and 82 degrees Fahrenheit. It is not safe to heat a tank smaller than 5 gallons, but make sure to keep a thermometer submersed in the water so that you can moniter the temperature. Choose heaters for tanks 5 gallons or larger very carefully. 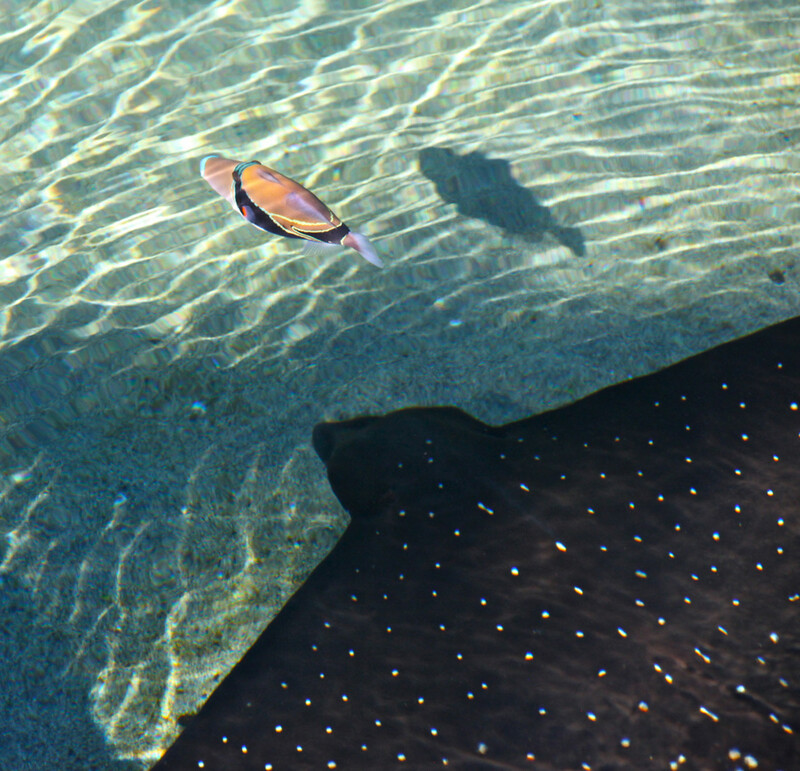 Medium to large substrate along the bottom of the tank not only looks pretty, but it filters any heavy debris that sinks to the bottom. Plant leaves, real or plastic, provide shelves for your fish to rest on. Bettas can be stressed in a completely open tank, with nothing to rest on or hide in. Betta fish are carnivores, and require a varied diet of regular Betta pellets and live foods, like bloodworms and brine shrimp. Feed your fish once a day. Betta can go the weekend without any food, but if you leave for the week you will need to leave an automatic feeder or a caretaker. Drop pellets into the tank one at a time so that your Betta has a chance to eat each piece. This will reduce waste and food debris in the tank. Feed slowly for 2-3 minutes, or until the fish stops eating. Never overfeed your fish because they will eat until they become sick and die. If you see the fish looking bloated, stop feeding immediately. Male Betta, a.k.a. the Siamese Fighting fish, have a reputation for being highly aggressive. Placing two male Betta in the same tank will lead to a devastating fight to the death. If you would like to see your male Betta fish display, place a mirror just outside of the tank. He will challenge himself! Betta will eat any fish small and appetizing enough, and will be eaten by anything large and aggressive enough. Catfish or Plecos are great tank mates for your Betta. They occupy the bottom of the tank, and keep it clean, while the Betta generally stays along the surface of the water. I've heard that Bettas can cohabitate with Neon Tetras, and African Frogs. Keep in mind that the more fish in the tank, the bigger the tank should be! Betta can survive for short periods of time outside of water because of the Labrynth organ. Betta have very tiny, but very sharp and destructive teeth. 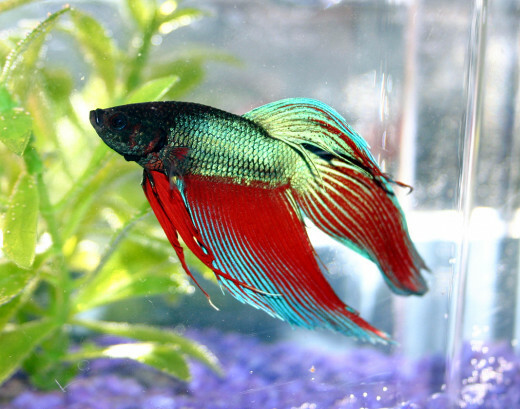 According to petsit.com, "The betta got its name from an ancient clan of warriors, called the "Bettah." The fish were given a combatant name after the fighting fish became popular in the mid-1800s. In fact, the sport became so renowned in Thailand that the former King of Siam had it regulated and taxed! Spectators of the sport based their bets on the bravery of the fish, rather than the damage inflicted by the victor." Yes, they do! They like to nestle or wedge themselves in leaves or other tank decorations. They normally sleep at night. Make sure to turn the light off at night if your aquarium has a light. Yes.... There are several different varieties of Betta, some with bigger, showier fins that will look larger. Males grow much larger than females. Once a Betta has reached maturity, it will stop growing, and a fish that is stunted from living in a small tank or in inadequate water conditions will stop growing as well. How big can a betta fish get? A female Betta may only grow to 1.5 inches, but some male Betta can grow up to 3 inches. What is the typical betta fish life expectancy? A healthy Betta fish can live 2-3 years, and sometimes longer. what's crazy about betta fish is the fact that everyone just feeds them those stupid pellets the fish stores give you and they literally hate those things. If you try to give them dried shrimp it works out great because they freakin go crazy for that stuff and they beg for it. I have 6 betta fish right now and my girlfriend named all of them haha. Thanks TropiCoaqua-- I'm always amazed at all the colors there are in Betta. It's incredible! Scribnet-- I have never tried keeping male and female Betta together because I never wanted baby Betta, and I've heard conflicting things. Some people suggest not keeping a male and female together, and other people suggest keeping a single male with a group of females. I suppose it all depends on how much space they have and the temperment of the fish! Great Hub! I owned a Betta fish...the only fish I ever had and he started in a fish bowl and graduated to an aquarium of his own. I don't remember exactly how long he lived, but it was way over a year at least. He was beautiful and a pleasure to watch . 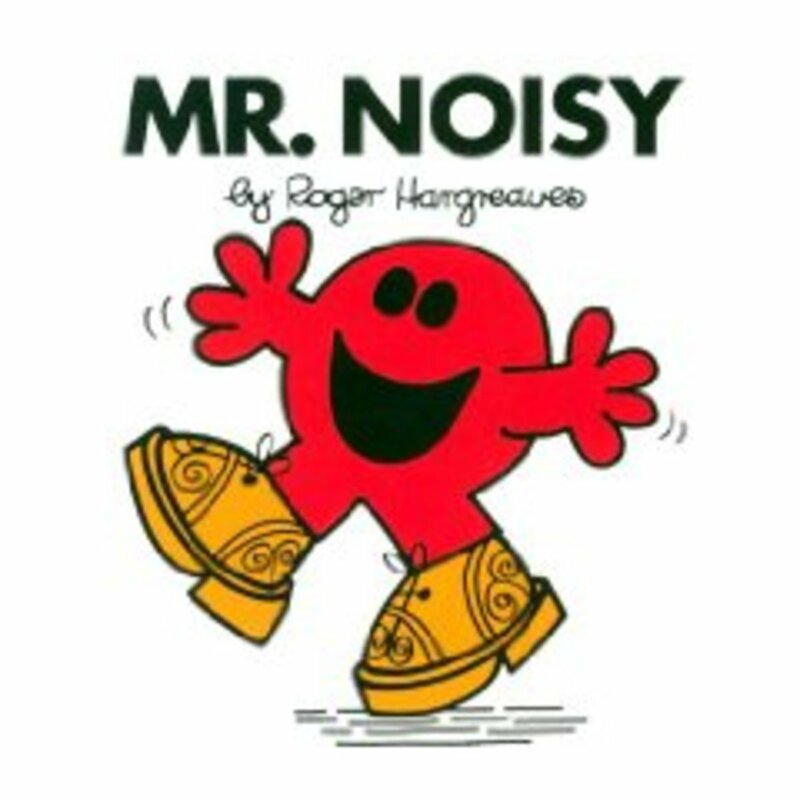 I did not know some of these facts as I had him way before I had the internet. It is so great to have this information because the Betta are gorgeous. Good article,mate. Bettas are an all time favorite in India as well. I do wish they were housed in bigger aquariums than the small bottles and mini bowls they are usually kept in. Here,they are locally known as 'Fighters' .Of late,I do see some beautiful variations coming in from Singapore and Malaysia,in the market.